This seminar will feature special guest TAGteachers Joey Iversen, Karin Coyne and Abigail Curtis so there will be a wealth of expertise and experience here for you to bask in! To earn Level 1 certification, you must attend this seminar AND send in three 5 minute videos demonstrating you applying TAGteach principles. You must also document your TAGteach experiences and submit this documentation. There is an additional $75 fee for the certification assessment. 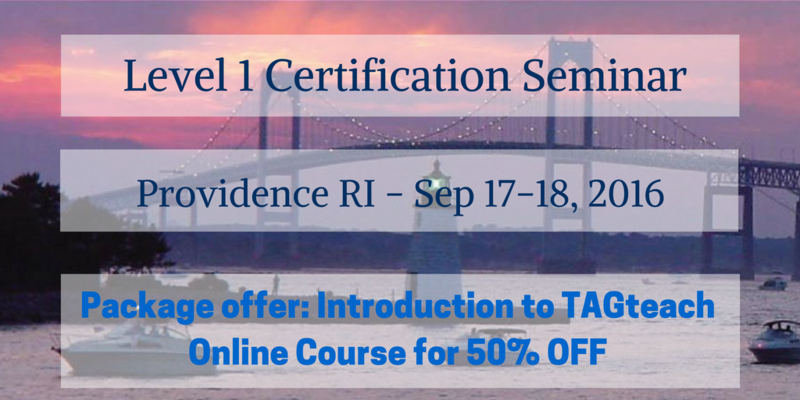 We are offering a package deal of 50% off the Introduction to TAGteach Online Course with registration to this Advanced Workshop (save $150). If you wish to obtain your primary certification online prior to this seminar so that this seminar can count towards your Level 1 Certification, you can do so by taking the online course and submitting the required materials for review in advance of the Advanced Workshop. IMPORTANT: Make sure you put zip code into your GPS/maps app, or you may wind up in the wrong city! Important! Make non-refundable travel plans after Aug 15, 2016.